Last week was a week of very healthy eating, and at the end of it, I just wanted to bake something sweet. 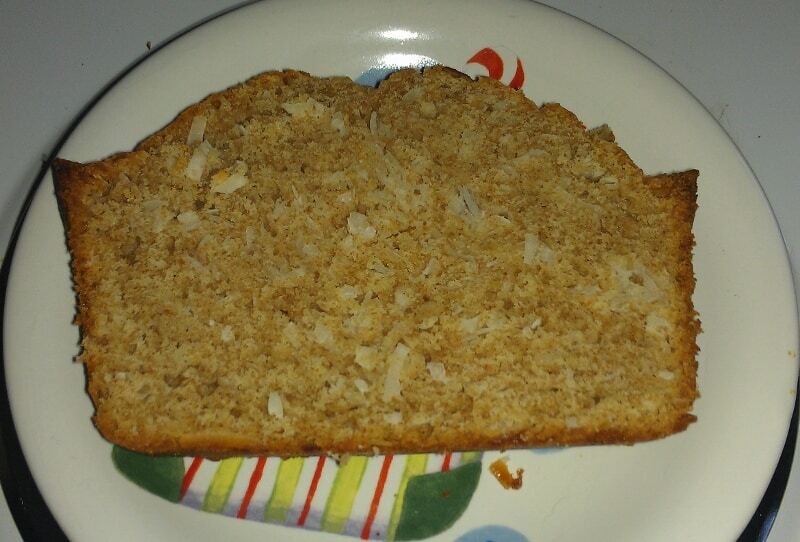 One recipe I’d wanted to make for a while was Coconut Bread, and I was excited to finally have the excuse to make it. My changes: I used almond milk since I didn’t have regular milk. I substituted 1 cup whole wheat flour for some of the flour. I used 1 teaspoon of cinnamon instead of 2. I used oil in place of melted butter, and weighed out my sweetened coconut rather than scooping it. The recipe was simple to make. I combined all the dry ingredients (including coconut), separately whisked together the wet ingredients, and stirred them into the flour mixture, mixing until just combined. I scraped the batter into a greased and floured 9-inch loaf pan and baked at 350F for 1 hour. 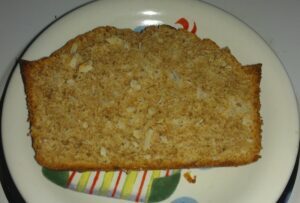 I turned the bread out of the pan after cooling for 5 minutes, and ate my first slice after an hour. See the flecks of coconut? The bread was sweet and lightly cinnamoned; I would consider leaving the cinnamon out entirely and adding more vanilla. The almond milk was unnoticeable. The bread was moist, and the crust golden and delicious. At first, I noticed the chewy texture of the coconut but didn’t notice the flavor too much; Alex disagreed, saying he thought it rather noticeable. I expected an over-the-top coconuttyness, which I could have accomplished with coconut oil and coconut milk, but luckily this bread is a little more subtle than that. This bread grew on me over the weekend once I learned to taste past the cinnamon. This bread is a welcome change from banana bread, and was very easy to make. It’s definitely worth making again sometime.